Summary : This tea from the Dragonwater Tea Company (now out of business) is a real powerful tea in terms of flavor. And that flavor is all lemon. If you love lemon teas, well...this tea has your name on it! Review : It's funny how you just get in the mood for something. Or conversely...how you simply aren't in the mood for something. I found myself this evening with a case of the latter. I just was NOT in the mood for any tea that might taste like grass...thus ruling out green teas. Yet, anything black tea related didn't exactly see inspiring either. Peppermint would have been great of course...my sweet tooth talking...but I couldn't find a peppermint tea I hadn't tried yet...I'm feeling experimental. And so I picked through my tea collection. And the first tea of interest I came across was a Hibiscus Lemon tea from the Dragonwater Tea Company (now out of business). I liked that idea...lemon...hibiscus. Lemon in particular...seemed to fit the odd mood I found myself in. And so I ripped open the package and gave the tea a whirl. This Hibiscus Lemon herbal tea from the Dragonwater Tea Company (now out of business) contains the following ingredients : "hibiscus, lemon grass, and lemon peels." I knew at ONCE that this tea was going to be really powerful in flavor. Wow...talk about the aroma of lemon in this tea. And since I love lemon teas, well...let's just say I was looking forward to giving this tea a try! Now, the flavor of this tea was surprising...surprisingly strong, even for a lemon tea. The lemon flavor of the tea is just super potent...and really good if you enjoy lemon. But then again, what should I have been expecting...the taste of mint in a hibiscus lemon tea??? Admittedly, you'll be hard pressed to find the hibiscus flavor in the tea. But since I love lemon, truthfully, I really didn't care! The bottom line is this...if you enjoy a strong lemon flavored tea...well...this tea is indeed for you. Recommendation : Yes. 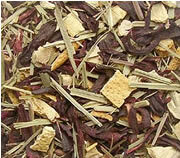 I you love lemon tea, this tea is indeed for you as it has an incredibly strong lemon flavor. Brewing Instructions : Use 1.5 teaspoons of tea leaves. Pour 1 cup (5.5 ounces, but 6 works quite nicely) boiling water over the leaves. Let the tea brew for 5 minutes.